The gut plays such an important part in our daily lives yet many of us are guilty of not really knowing or listening to our gut. But it is worth getting to know this vital organ a little better – so to help you, the experts at Love Your Gut have put together some surprising facts about our digestive system and why we all need to love our gut a little more. The gut is the part of the body which engages most intimately with the external environment, despite the fact we cannot see it. Processing an enormous variety of food and absorbing nutrients, it is also exposed to a myriad of potentially harmful substances and agents. 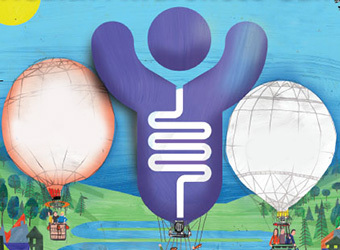 The gut is the largest component of the body’s immune system – informing us about, and protecting us from, our food. The gut has its ‘own ‘brain’, which contains 500 million nerve cells. The small intestine is 6 metres long. Here food is broken down, ready to be absorbed into the blood stream, and it can take 2 – 4 hours for a meal to be processed in the small intestine. The rumbles and groans in your abdomen are caused by the movement of gas and fluid through different regions of the gut. Because the gut is so sophisticated, many factors can affect it; from diet, illness and exercise, to medications and even age.